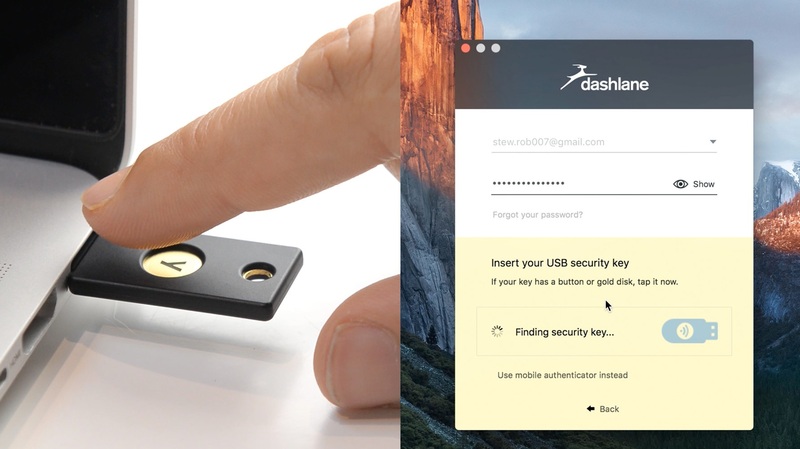 Dashlane is the first password manager to support U2F YubiKeys, an innovative and universal two-factor authentication standard, backed by Yubico and the FIDO Alliance®. If you’ve ever had to enter a security code when you log in to an account from a new location or device, that's two-factor authentication (2FA). In addition to your login and password, 2FA acts as further proof that you are you, better securing your devices and sensitive data. YubiKey makes 2FA even simpler—but just as secure—by replacing long security codes and the need for additional devices with the tap of a button on the YubiKey. YubiKey integrates with our Dashlane Premium plan. It works on any computer with a USB port, so there’s no need to hunt down security codes sent by text or email. Simply plug in your USB key and go. Set up YubiKey in Dashlane in 3 easy steps. Turn on two-factor authentication in Dashlane. Add your YubiKey to Dashlane. Plug in your USB key and go! Interested in deploying Dashlane Business with YubiKey for your company? Learn more about our best-in-class business features.